09.11.08 The Untouchable DJ Drastic Appearing Live! Thursday Night Strike @ Strike Long Island! The Untouchable DJ Drastic Live! 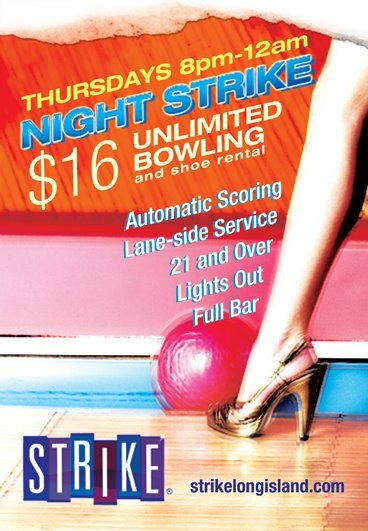 Thursday Night Strike @ Strike Long Island! Strike is no ordinary bowling alley. Strike Long Island is a dramatically transformed ‘50s-era bowling alley turned cutting-edge entertainment destination. Strike houses 27 lanes of glow-in-the-dark bowling, each having its own semi-private banquette with waitress-provided food and beverage service. Gamers of all ages will marvel at Strike’s vast “Hall of Game” arcade. Strike Long Island houses more than 50 state of the art videogame machines and custom billiard tables. With dozens of LCD monitors, neon lights illuminating the entire venue, and a full alcohol bar; your experience will inevitably be a memorable one. Thursday Night Strike is a unique night out for adults 21 years of age and older. From 8:00PM – 12:00AM, Strike places elite DJ talent at the forefront of their emphasis night. Enjoy $16.00 unlimited bowling and shoe rental in addition to music by the industry’s elite. Strike has a reputation as a premier entertainment venue for all ages from coast to coast. It’s no surprise for the company to reach out to premier talent for their 21+ emphasis events. The Untouchable DJ Drastic signs on as Thursday night’s headliner which means you’ll be rocking from the minute you arrive straight through the weekend. In fact, it’ll leave you just enough time to sleep for a couple of nights and do it all again the following week. With all the stresses of the world, the recession, etc. isn’t it time you did something fun on a Thursday night? Be part of Long Island’s most unique 21+ event!